" ବିଦ୍ୟା ଅଟଈ ମହାଧନ ।। ବାଳକେ କର ଉପାର୍ଜନ" – ଶ୍ରୀ ଉତ୍କଳ ଗୌରବ ମଧୁ ସୁଦନ ଦାସ୍ । If your device can display this sentence in Odia (Odia) perfectly, then your device supports Odia and Swarachakra should also work well. If you do not see any text, or if some of the words are incorrect, Swarachakra may not work well. Swarachakra Odia (ସ୍ଵର ଚକ୍ର ଓଡିଆ) is a touch-screen keyboard for inputting text in Odia. (Swarachakra is available in Hindi, Marathi, Gujarati, Telugu, Kannada, Malayalam, Punjabi and Bengali). Swarachakra Odia (ସ୍ଵର ଚକ୍ର ଓଡିଆ) uses a logically ordered design based on the structure of Odi script (ଓଡିଆ ବର୍ଣ ମାଳା). 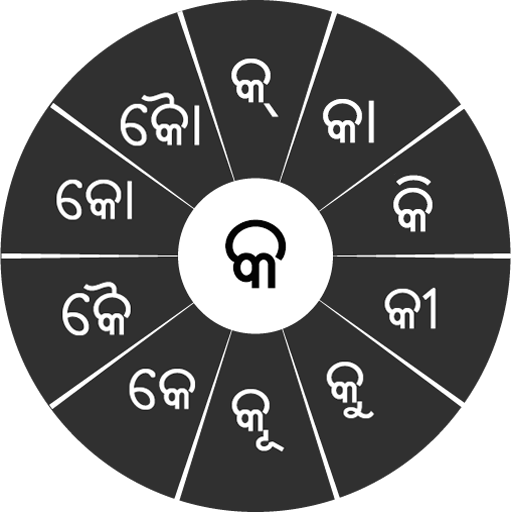 Swarachakra Odia (ସ୍ଵର ଚକ୍ର ଓଡିଆ) displays the consonants sequenced according to the logical structure of Odia script (ଓଡିଆ ବର୍ଣ ମାଳା), phonetically grouped and arranged in a grid similar to those found in most school textbooks. In Odia (ଓଡିଆ), we frequently need to type a combination of a consonant (କ) and a matra (ମାତ୍ରା) (ା) like କ + ା = କା. When you touch a consonant, a chakra with combination of consonants and 10 frequent matras (ମାତ୍ରା) pops up (କା, କି, କୀ, କୁ, କୂ, କେ, କୈ, କୋ...). The chakra gives a preview of the possible character combinations. To select a combination, you slide the stylus or finger towards it. Typing conjuncts like କ୍ରି, ସ୍ଥ, ଚ୍ୟ is particularly hard for most people. Swarachakra makes it easy. First tap on the first part of the combination and select the halant from the chakra (କ + ୍). Swarachakra then shows a preview of all possible conjuncts that begin with that consonant (ସ + ୍ + ତ = ସ୍ତ; ସ + ् + ଥ = ସ୍ଥ...). If you need to add a matra, select it from the new chakra like earlier (ସ୍ଥା, ସ୍ଥି, ସ୍ଥୀ, ସ୍ଥୁ, ସ୍ଥୂ...). To type ref (ରେଫ୍ ଯୋଗ) (ର୍ଥ), a phala ଫଳା (ଦ୍ମ୍, କ୍ୟ, ଗ୍ନ..) or adho bindu jukta letter ଅଧୋ ବିନ୍ଦୁ ଯୁକ୍ତ ବର୍ଣ (ଡ଼, ଢ଼), first select the corresponding key from the right-most bottom keys, and then type as usual. Complete vowels (ଅ, ଆ, ଇ, ଈ, ଉ, ଊ, ଏ, ଐ, ଓ, ଔ) appear in a separate chakra on the bottom right. The less used vowels and matras are next to it (ଃ, ଂ, ଁ, ୠ, ୃୄ). Numerals, symbols and rarely used characters appear on a shift. You could also switch to the QWERTY keypad temporarily to input English characters. First, install Swarachakra Odia by clicking the “Install” button above. Next, you need to “enable” the keyboard. To enable, open “Settings”, select “Language and Input” and check the box in front of ସ୍ଵର ଚକ୍ର ଓଡିଆ (Swarachakra Odia) in the “Keyboard and input methods” section. Finally, click on the “Default” option in the “Keyboard and input methods” section, and select ସ୍ଵର ଚକ୍ର ଓଡିଆ (Swarachakra Odia) as the default keyboard. For any queries and suggestions, contact us.